Bishop Robert P. Deeley, head of the Roman Catholic Diocese of Portland, addresses the nearly 500 people Wednesday night who attended an interfaith opioid healing service at St. John Catholic Church. 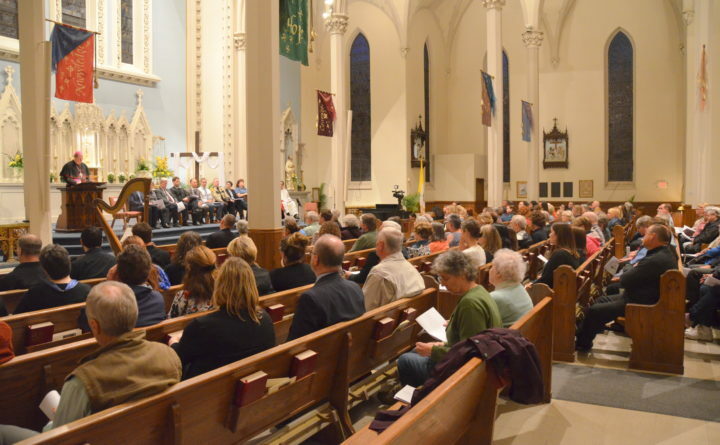 Organizers of the service that drew an estimated 500 people to St. John Catholic Church on York Street hope he is right, and that the area’s faith communities work together with other institutions to help stem the rising tide of opioid addiction and overdose deaths. Leaders in law enforcement, health care, substance abuse recovery and government joined religious leaders from the Catholic, Protestant and Jewish communities to seek healing and hope. The service was planned for those directly impacted by opioid addiction, including families who have lost loved ones. Sprague’s observation sounded like a call for action. Penobscot County Sheriff Troy Morton suggested a three-pronged approach to the crisis that has personally impacted members of his department. Morton said faith communities are best equipped to focus on prevention. David and Shelly Yankowsky, both Maine State Police employees, spoke of their son Adam’s death of an overdose last year at the age of 25. Less than a week before he died, Adam was revived with Narcan. Shelly Yankowsky spoke Wednesday of her last conversation with him. The chief medical officer at Acadia Hospital, Dr. Tony Ng, urged attendees to join forces to address the crisis rather just reacting emotionally. Houses of worship in the Bangor area have been asked to devote weekend services to the topic of addiction and to make available materials tucked inside the order of service for Wednesday’s event. They included the names and numbers of area addiction providers, statistics on the rising number of overdose deaths and babies born affected by drugs over the past 20 years, and suggestions on how faith communities can help people impacted by substance abuse. If you or someone you know is struggling with addiction, call 211 or visit www.211maine.org.